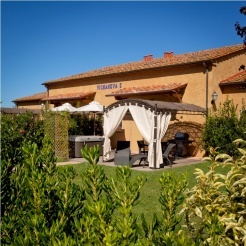 Among rolling hills with olive trees and vines, we are in the beautiful Etruscan coast a few steps from the sea. The medieval villages, the cities most famous and the beautiful wine route make this area unique. Also heated thermal complex and delightful restaurants and wine shops are waiting for you!. Do you want to learn Italian on holiday? At Podere Vignanova you can! There is no better time like a vacation to deepen the knowledge of the Italian language and experiencing on site your progress! In cooperation with Accademia Libera of Querceto, qualified and professionals teachers will be at your disposal for Italian language lessons. Lessons will take place outdoors under the veranda of the farm overlooking the hills of Castagneto Carducci or in a room at our shop. Course Schedule: 5 lessons of 2 hours each one, 1 visit to a street market and more. Ask for the programme!.